Sadly the wine I buy doesn't come in wooden boxes like these. What do you expect on a £5/$9 budget? 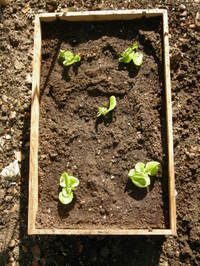 Covered with a sheet of glass they make pretty good cold frames for hardening off plants. Planted up they're an attractive container for salad vegetables. Ask your friendly wine merchant for some. Majestic, the wine warehouse outfit, will give you boxes in return for a donation to charity. Just remember to drill some holes for drainage and to save filling the whole box with soil (it weighs a lot) fill the bottom with broken up polystyrene - like the type that comes with computer packaging. Here I've planted one up with Tom Thumb grown close together and I'll harvest early and small. 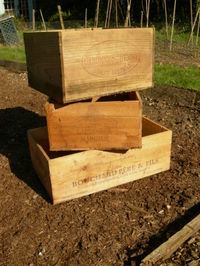 Because they're not too heavy I can move the boxes around to catch the weak Spring sun. I knew they liked showers...but a bath as well??? It seems that a compost trench is a good idea and Jane at Horticultural suggested I line it with cardboard to help with water retention. I don't have any to hand but in the past I've used newspaper - sorry Jane. There are more uses to the Guardian than becoming tomorrows fish and chip wrapper! Maybe I'll use the endless bags of shredded paper produced by my wife's office. 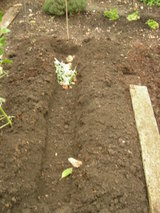 I've started a compost trench where I plan to grow tomatoes and butternut squash next year. I wonder how long it will take to fill with vegetable peelings, tea bags and coffee grounds? Could it attract rats, mice and squirrels - I'm thinking of filling it in as I go - a good idea? I've got to admit to buying these beauties as plug plants and growing them on. Now I've come clean on that I have to say they taste delicious. The texture is firm and they're bursting with sweetness. Just add a dash of olive oil and a twist of salt. And they're great to look at on the plate. 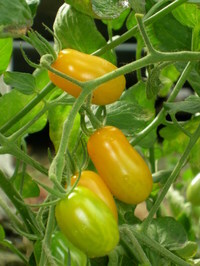 Golden Sweet they're called and I've searched the catalogues but haven't found a yellow plum type like them. Doing an internet search, following the suggestion in Bifurcated Carrots recent post, I found seed called Golden Sweet referred to as a 'gold grape' type. I suppose they look grape like as well. But at £2 for five seeds that seemed high. Has anyone successfully saved seed from commercially raised varieties like this? The label doesn't tell me if it's an F1 variety and likely not to come true from seed. Is there another variety available as seed you'd swear by? What a frustrating year if you are a veg grower - fierce heat when you don't want it and lack of water unless you're lucky enough to live in the North or garden an allotment still running hosepipes. 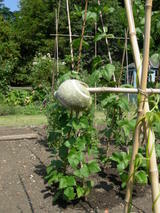 Not the most promising year then to experiment with a different method of growing climbing beans. But I tried this out on my Blauhilde and Neckar Gold. Most opt for the convential wigwam or rows - 3 or 4 bamboo canes or hazel poles, if you're lucky to get them, spaced 2 -3 feet apart and tapering 6 or 7 feet to meet at the top. But this year I've inverted the canes so they lean out and put a bracer cane low down for stability as you can see in the picture. 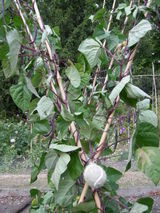 Result - vines that lean away from each other as they grow to the top. 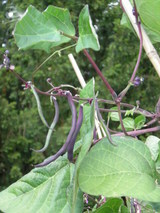 In theory the plant has more air and light and gravity holds the beans away from the canes making picking easier. I just haven't been able to give 'em enough water so I'll experiment again next year and compare the yield. Always wary of poking an eye out on the sharp end of canes I've hit on a way to make cane caps that's free and easy. Take a walk in a park and collect all those tennis balls you see dogs carrying about and then abandoning when something else takes their interest. 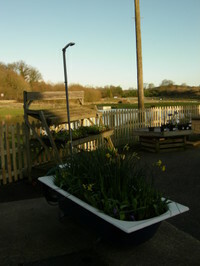 Good hunting grounds are by the car parks and entrance gates or you could skulk around the tennis courts. Cut a hole in them and pop them on the end of the canes. Very Blue Peterish. Here's one I made earlier!